A colorful parade in Lima. Oh, how unprepared we were when my 27-year-old self-employed web developer boyfriend and I, a 24-year-old engineering geologist, decided to move from the U.K. to Peru! When asked “why?” we mumbled that we wanted to practice our Spanish, learned long ago and seldom used, that Spain didn’t attract us, and that we wanted to see Machu Picchu. We were still child-free, we were young, adventurous, looking for some fresh air, and I was looking to work for a new company. We chose to live in Lima because that’s where most of the companies are based, so there is more work available. We also chose Lima because it’s a good base to visit the rest of the country and South America as a whole. I found a job with an international company in the mining industry before I arrived, and they arranged my flights, told me which papers to legalize before arriving (e.g. university diploma…), and the type of visa to obtain. A woman in Lima in front of the Cathedral. My boyfriend, on the other hand, being U.K.-based and self-employed, maintained his status back home, and came to Peru as a tourist, working over the web for European clients. Fortunately, at the time there was no time limit for staying in Peru as a tourist. You enter with a tourist visa valid for 183 days. There are constant changes to visa laws, so please check a local embassy or consulate for the latest information. To be able to work legally in Peru you need to enter with a business visa, which I did, but it has to be valid for 90 days, which was not my case. This is because a tourist visa cannot be converted to another type of visa while in the country: you need to exit Peru, go to a Peruvian consulate abroad and get the right type of visa (work, artist, religious, retired, or whatever fits your status). Since my business visa had expired before the immigration procedure was completed I was forced to leave the country to obtain a new visa. This obviously led to a long delay in legalizing my status as a working resident. Bureaucratic paperwork is one heck of a pain! My boyfriend opened a company here in Lima. There are two solutions to opening a company as a foreigner: (a) you invest US$25,000 or (b) you hire someone to do it for you and only invest a small capital (say US$2,000). My boyfriend found an accountant, who then became the manager of this newly founded company. Both my boyfriend and I became directors, recruited by the manager-accountant. Then my boyfriend started his own long procedure of acquiring a resident visa. The procedure involves acquiring a work contract, having the ministry of work stamp it, sending it to the immigration office and making the demand for a visa, getting the visa sent to the consulate of your choice, and then going to retrieve it a couple of months later, before finally entering Peru as a brand new resident. You then need to validate your new status by visiting the immigration office again and obtaining your Carnet de Residencia (resident card), but that’s easy considering the lengthy procedures you’ve already been through. Time does not have the same significance as in more developed countries. In Peru, spending two hours in a queue, or experiencing a bus being delayed for four hours, is quite normal. The only thing to do about it is to learn to be patient. Accommodations are readily available in Lima, and there are choices for all budgets. Housing options range from short-term rentals in apartment hotels (US$200 per week) to cheap apartments in residential areas (US$100 per month), as well as expensive penthouses with sea views and 24/7 security guards (US$2,000). And multi-story apartment complexes are being built everywhere (if you’re worried about the noise that creates: don’t. They use mostly hand tools so it produces less noise than if they used powered machinery). We chose the upscale residential area of Miraflores, along the Pacific and near the modern Americanized shopping center Larcomar. We live in a 2-floor apartment which has an ocean view from the balcony. It is too big for just the two of us and a tad expensive, but it’s in an area where we feel safe and it’s not too noisy. Lima, in general, is a noisy, smoggy, humid and crowded city, so it is difficult for those of us who like peace and quiet. If you like quiet pastoral life, then this may not be the place for you, though you have access to the countryside. Work can easily be found in mining industries, teaching English, or doing translating/interpreting jobs. Exporting Peruvian goods or creating a company in advertising/tourism/information for expatriates can also be good options, but requires more work. Speaking Spanish is definitely required to land a job here. The standard number of hours is 48 a week, but in foreign companies, like mine, this may be less (40 hours/week). Standard Peruvian salary is no more than US$200-300 per month for people on paid internships or for the less experienced. The pay is similar for what are normally low-wage jobs such as waitressing, shopkeeper, etc. However, experienced mining engineers can earn above $1,000 per month. People come from all over the country to work in Lima, searching for better opportunities. 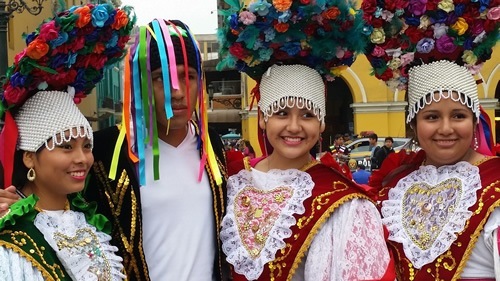 Peruvian culture is surprisingly diverse. People from Cuzco are very different than the city-dwellers of Lima, and the Arequipeños (people from Arequipa) are a people of with a strong sense of identity, considering themselves to be very different and independent from the rest of the country and with a strong sense of community. People will try to sell you things at a higher price, especially in touristy areas like Cuzco, but in most cases, people are honest. They often ask foreigners where they are from and what the traditions/national dishes/landscape and weather of your home country. Locals are curious about where you have visited in Peru. One unusual aspect of the culture that I noticed is a tendency to put their own people down: Peruvians will always advise you not to trust Peruvians! Otherwise, they are hospitable, friendly, and open for discussions. I personally don’t always feel comfortable walking on my own, because being a European blonde in my mid-twenties; I get whistled at and chatted up a lot. Although this irritates me, I have never felt threatened. People at work are the same as most colleagues worldwide: guys play football and enjoy beers together, girls are gossipy and giggly. One of the biggest differences is their conservative religious outlook on life. If you are in a relationship, people expect you to get married, and if you have children but are not married it is frowned upon. Many Peruvians go to church, and joggers will stop to pay their respects if they pass a statue of the Virgin Mary. Bosses are the supreme authority and they have “the power,” so employees are often intimidated and won’t stand up. Instead, they complain to other colleagues. Again, you can find this behavior in many places in the world. A somewhat "macho" tendency is clear in relationships between men and women: Men see themselves as more knowledgeable and more powerful, while women often have smaller jobs and administrative tasks. Women can experience inappropriate comments about their marital status (e.g. if you live away from your husband) from male colleagues. 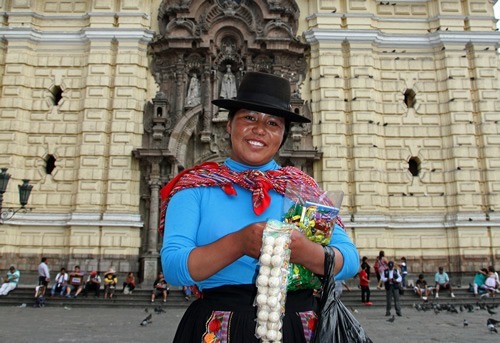 In sum, Peru is a conservative, male-dominated society, with a strong religious influence. Food in Peru can be very, very good. The food here is full a great surprises. First of all, it’s cheap, especially at lunchtime where you can have a filling two- or three-course almuerzo (lunch) with drinks for a couple of U.S. dollars. Eating at a really posh restaurant will only set you back 100 dollars or so, so Lima is a good place to experience the luxury you can’t afford elsewhere. Peruvian cuisine is exquisite in my view; up there with French and Chinese gastronomy. I even took a cooking course at the famous academy Cordon Bleu to learn to cook the famous ceviche, the national dish of raw fish in spicy lime juice. 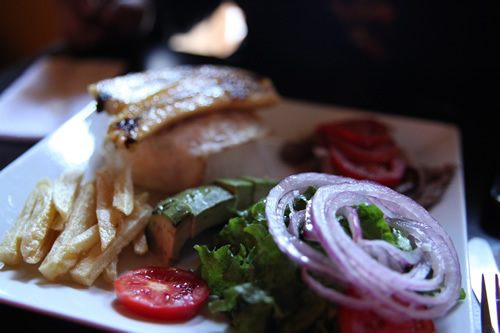 Fish in Peru is really tasty, as are the fruits and vegetables. The mangos and avocados are the best I’ve ever had. There are quite a few vegetarian restaurants as well. My time living in Peru is close to being over now. All in all, it has been a challenging change of scenery. Adapting to noisy and polluted Lima, with its 10 million inhabitants, speaking a language other than my own daily, has certainly not been easy. The cold grey winters and the sun setting at 6.30 p.m. year-round have been a surprise, but so have the wonderful landscapes, the kind people, and the wonderful food.